Matthew Bradley has been playing guitar in bands and as a soloist for over 20 years. After moving to the Pacific Northwest in 1997 Matthew studied jazz and classical guitar at Mt. 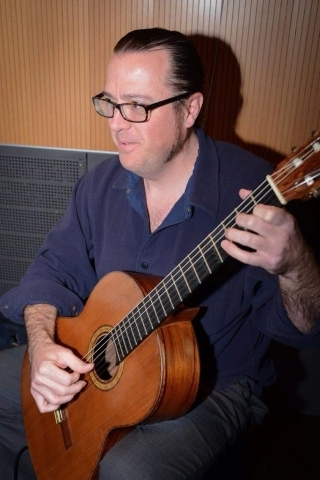 Hood Community College and focused on classical guitar studies at Portland State University where he received his Bachelor's Degree with honors in Music in 2002. He has played in such Portland bands as The Still Fracture and with Portland/Vancouver based touring band Obscured by Clouds. Matthew also performs on solo guitar and is a regular at Rimsky Korsakoffee House in Portland. Matthew has teaching assignments at Mt. Hood Community College and Portland Community College. He has been on staff with the Beacock Music Education Center since 2004. His personal studies and performance experience in Rock and Roll, Classical, Blues and Jazz make Matthew's approach to teaching guitar very open. As he puts it, "I tailor the lessons to fit with the student's level, but I try to keep it interesting. One week we might try a Spanish guitar song and the next week we could try something else, like a current rock tune. I try and keep the possibilities open." All facets of music studies are included in the lessons: Chords, Scales, Rhythm, Note Reading, Chart Reading, Lead Playing, Theory, and Composition. Matthew Bradley has studied with some great guitarists: Bryan Johanson, Director/Chair Music Dept. P.S.U. ; Scott Tennant, L.A.G.Q. and U.S.C. Thornton School of Music; Jeff Ashton, U.P. ; Carlos Barbosa-Lima, Brazillian Guitar Wizard. If you have a question for Matthew, or wish to contact him, please fill out the form below. The message will be passed along to the Education Center and they will get back to you..